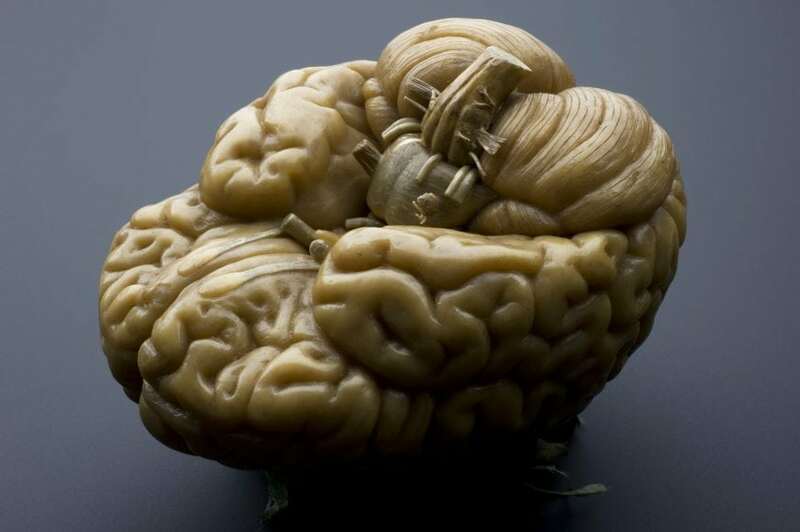 The idea to actively modulate the human brain with electrical currents fascinates people since the ancient times. For example, the Romans used the torpedo fish to treat pain, and in the 18th and 19th century the Galvanic Battery and the Voltaic Pile were utilized in an attempt to treat melancholia. Since the early 2000s researchers started to use a modern variant – transcranial direct current stimulation (tDCS) – to explore the effects of a weak current between two electrodes placed on the human scalp on the brain and possibly on behavior. tDCS is a non-invasive method of cortical stimulation. The applied direct current flows from an active to a reference electrode, partly being deflected by the scalp and the rest being delivered to the brain tissue, thereby inducing diminutions or enhancements of cortical excitability. Depending on the timing of stimulation the underlying mechanism revolves either around sub-threshold modulation of membrane potentials or synaptic activity and neurotransmitter distribution. The basic idea how single-session tDCS affects cognition is that the current flow leads to excitation of the underlying brain area under the anode and to inhibition of the targeted area under the cathode. With that being said, some factors contributing to tDCS effects and what influences stimulation outcomes are not yet fully understood. We added to this emerging research field by analyzing whether single-session tDCS can affect cognitive control – that is the human ability to respond to relevant information while ignoring interfering information. In this study, we used the so-called Stroop task that is one of the best established experimental paradigms in cognitive psychology. In its original form color words are presented in different ink colors while participants’ task is to report the ink color (ignoring the word color; e.g. the word BLUE in green ink must be responded to with ‘green’). Congruent trials (GREEN in green ink) elicit faster reaction times and fewer errors than incongruent trials (GREEN in red ink). Most prominent theories on the Stroop effect (the difference between congruent and incongruent trials) assume that the irrelevant words’ meaning is automatically processed and therefore interferes with responding to the ink color in the case of incongruent conditions leading to slower reaction times and more errors. The neural generators of the processes underlying the Stroop effect are assumed to be located mainly in the left dorsolateral prefrontal cortex (DLPFC). The left DLPFC is a brain region that has not only been associated with the Stroop task but with executive or cognitive control in general, particularly with solving interference (e.g., when distracting stimuli accompany a target). For the study thirty-two healthy participants were recruited and randomly assigned to one of two tDCS conditions: (1) anodal or (2) cathodal stimulation of the left DLPFC. All participants had normal or corrected to normal vision and no prior record of neurological, psychiatric or cardiovascular diseases. Participants were instructed to complete two sessions of the Stroop tasks; once before and once after twenty minutes of tDCS. The Stroop stimuli consisted of the words GRÜN, GELB and GLATT (green, yellow and smooth in German) printed in either green or yellow. Each possible stimulus was presented 64 times, which resulted in 128 trials per condition in the pre- and 128 trials per condition in the posttest. Reaction time (RT) to each stimulus was recorded in milliseconds (ms) from the onset of the stimulus presentation until the response was detected. Additionally, the error rate was recorded. After the first Stroop task session, a constant current generator was used to apply 0.5 mA for 19 min over two different sized saline covered electrodes. There was a ramp up/ramp down period of 30 sec at the start and end of the transcranial direct current stimulation. The electrodes used to apply tDCS to the head were 9 cm² (3×3 cm) and 35 cm² (5×7 cm) in size, resulting in a current density of 0.056 mA/cm² and 0.014 mA/cm². The smaller electrode was always fixed to the left DLPFC (F3 Position according to the extended 10–20 electrode reference system) while the larger one was applied to the parietal cortex (POz Position). For reference see Figure 1. Thus, the experiment was based on a 2 (test: pretest vs. posttest) × 2 (tDCS condition: prefrontal anodal vs. prefrontal cathodal) × 3 (congruence: congruent vs. neutral vs. incongruent) mixed design with only the tDCS being varied between participants. Error and RT Stroop effects were submitted to a 2 (test: pretest vs. posttest) x 2 (tDCS condition: anodal vs. cathodal) MANOVA. Results showed a statistically significant disordinal interaction of test x tDCS condition F(1,30) = 4.33, p = .046, ηp² = 0.13, suggesting that differences in Stroop effects between the pretest and the posttest were dependent on stimulation condition. 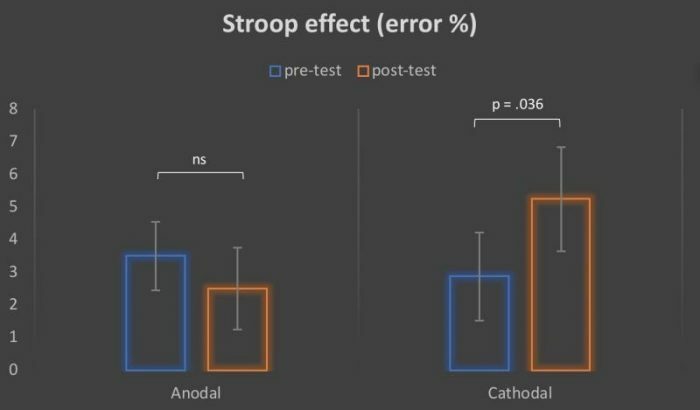 Specifically, the Stroop effect significantly increased for the cathodal stimulated group in the posttest (p = .036) but not for the anodal stimulated group (p = .437; see Figure 2). Closer examination of the data shows that the larger Stroop effect after cathodal stimulation was mainly driven by an increase of the error rate in the incongruent condition. Since this significant interaction was only present in the error rates, we argue that cathodal tDCS lead to a higher change of DLPFC failure in interference processing. Although our results are promising, against the current background of literature, it is still unclear how tDCS impacts cognition and which cognitive processes can be modulated. 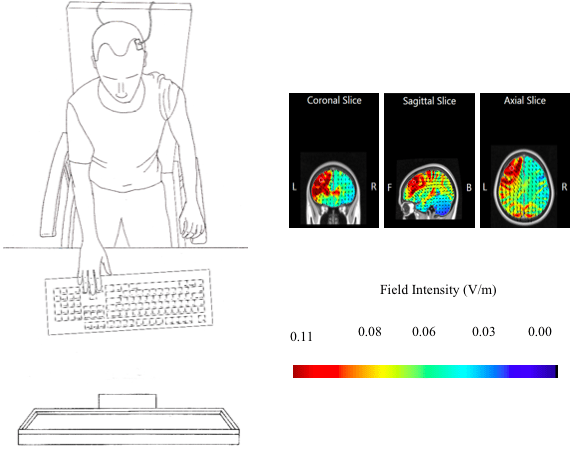 Therefore, we suggest a meticulous approach to the conduction of tDCS studies. In the present study, it was observed that cathodal tDCS over the left DLPFC can decrease Stroop task performance, probably due to a disruption of interference processing. This result fits many cognitive control and inhibition models in the neuroscience literature. These findings are described in detail in the article entitled Single-session tDCS over the left DLPFC disrupts interference processing, recently published in the journal Brain and Cognition. The study was conducted by Christian Frings, Thorsten Brinkmann, Maximilian A. Friehs, and Tim van Lipzig from the University of Trier. Maximillian A. Friehs is a Ph.D. student in the Department of Psychology, General Psychology & Methodology (Prof. Dr. Frings), at the University of Trier. His research is focused on the modulation of action control via brain stimulation and stress. Max received his B.Sc. (2015) and M.Sc. (2017) in Psychology from the University of Trier. Furthermore, Max has gathered diverse, international experiences in academic, clinical and industrial positions. My main research focuses on the processing of distractors. In a world full of possibly distracting stimuli, we must selectively attend to goal-relevant information and selectively ignore the currently goal-irrelevant information. How can we achieve this? One idea is that humans can actively suppress the cognitive representations of distrating stimuli, a process called distractor inhibition. Distractor inhibition is typically analyzed in experimental tasks, in which participants have to respond to a target stimulus while ignoring a distractor object or distracting feature (the Stroop task, the Eriksen flanker task, the Negative Priming task and so on); note, that inhibtion has been chosen by the APA as one of the 15 core concepts in cognitive psychology. Another idea is that distractors can be encoded and retrieved together with the target stimuli and the responses given to these targets, a phenomenon called distractor-response binding. Stimulus (and sometimes distractor)-response binding makes our behavior efficient by establishing nearly automatic SR retrieval routines that can emerge without much effort. Measurements of reaction times, error rates, and the electroencephalogram (EEG) are used to tap the processes of inhibition and binding in established, computer-based experiments. What about multisensory interference? Imagine you are focused on a visual task (say reading) while something non-visual disturbs you (say your ringing and vibrating mobile phone). Are distractors presented to several senses and additionally presented to currently inattended senses ignored in the same way than distracors in unisensory selection? Is distractor processing comparable in vision and, for example, in touch? These questions are currently under research and first evidence from blind participants suggests that distractor processing in vision and touch may differ between these modalities. And what about distractors of emotional content? Yes, that might be quite a different story. In fact, there is a long standing debate in cognitive psychology whether emotional stimuli are processed in a different manner as compared to non-emotional stimuli (e.g., they might allocate attention in a near to automatic fashion). Thus, I analyze in various established paradigms how selection of targets is influenced if the distractors do have emotional content. So far, it seems likely that the different mechanisms of distractor processing also differ in the way they are affected by emotional distractors. Is there any link to applied research? Yes, there is. Selection and interference are concepts that are important whenever humans interact with their environment. As a result, my research has clear impact on applied research in ergonomics; for example, recent experiments transfer binding effects to modern car driving-assistance systems. In addition, I collaborate with the local department of applied sciences (mechanical and automotive engineering) for optimizing usage of electric cars.